The pyramid of Kalkhulmantal! On the pyramid are placed treasure tiles each indicating a certain value. At the beginning of the turn, a player rolls the three special dice, then all players try to reach the value of one of the treasure tiles by combining, by simple operations, two or three of the numbers obtained on the dice draw. The fastest player takes the corresponding Treasure tile and returns the hourglass: there are only 30 seconds remaining for the other players to find other operations and win one of the Treasure tiles still in play! The higher the value of the tile, the more points it earns ... but in case of error, these points become penalties. Whoever has the most points at the end of the game wins. 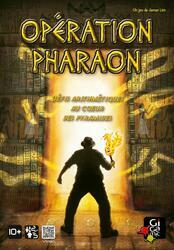 Operation Pharaoh is a simple-minded mental math game for the whole family.